The Appeal of Conscience Foundation (ACF) sponsored its 2017 Annual Awards Dinner on Monday, September 18, 2017 at the New York Hilton Midtown for the presentation of the Appeal of Conscience Awards to Brian T. Moynihan, Chairman, CEO, Bank of America; Paul Polman, CEO, Unilever and Masayoshi Son, Chairman, CEO, SoftBank Group Corp. Every year for the past 52 years, the ACF, founded by Rabbi Arthur Schneier in 1965, has worked on behalf of religious freedom and human rights throughout the world. This interfaith coalition of business and religious leaders promotes peace, tolerance and ethnic conflict resolution. The Foundation believes that freedom, democracy and human rights are the fundamental values that give nations of the world their best hope for peace, security and shared prosperity. 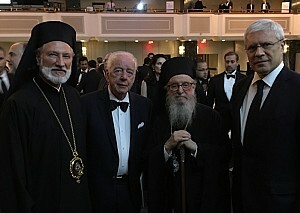 As in the past 18 years, His Eminence Archbishop Demetrios of the Greek Orthodox Archdiocese, a member of the ACF Board of Trustees, offered the Benediction to the Appeal of Conscience Foundation awards Dinner. His Grace Bishop Irinej was also seated at the Dias, accompanied by the Very Rev. Dr Zivojin Jakovljevic, Chancellor of the Diocese of Eastern America. His Grace has had a longstanding institutional relationship with the ACF and Rabbi Arthur Schneier, who has been very instrumental in fostering interfaith dialog on peace during the civil wars of the 1990’s in the Former Yugoslavia. In 1992, he sponsored the signing of the “ACF for Peace in Bosnia and Herzegovina” by Patriarch Pavle, Roman Catholic Archbishop Vinko Puljic of Sarajevo and Rais Ulema Jakob efendi Selimoski of the Islamic Community of Sarajevo. Among the numerous dignitaries present were the Honorable Boris Tadic, former President of the Republic of Serbia; and His Excellency former Ambassador Budimir Loncar, Senior Advisor to the International Experts Group of the World Council of Religious Leaders, and Advisor to the ACF and Center for Humanitarian Dialogue in Geneva.